Withee Public Library will be 100 Years old this year! An Open House will start our celebration on Tuesday, April 9, 2019, from 10 am to 6 pm. We will be honoring a lot of people. Refreshments will be served all day. Libraries relate to people of all ages in all walks of life, to their families and the future of their communities and the nation. It is believed that it is not the few great libraries, but the thousand small, that may do the most for the people. Brandon Hardin brings knowledge and enthusiasm to our community to create new programs and meet new challenges. He wants to get acquainted with community members, so stop in and have cup of coffee or cider with him. A day to recognize the valuable contributions made by our library workers. Thanks to Denise Holbrook-cataloger and librarian, Janice Arndt – children’s librarian and Carol Oryszcyn-Lego game coordinator, for their hard work, dedication and expertise. Trustees of the Withee Public Library that volunteer their time to keep the library updated and secure funds, are: Nancy Amacher, Jodi Rahn, Susan Kalepp, Anna Goerlitz and Louise Olszewski. Artwork featured until April 13. 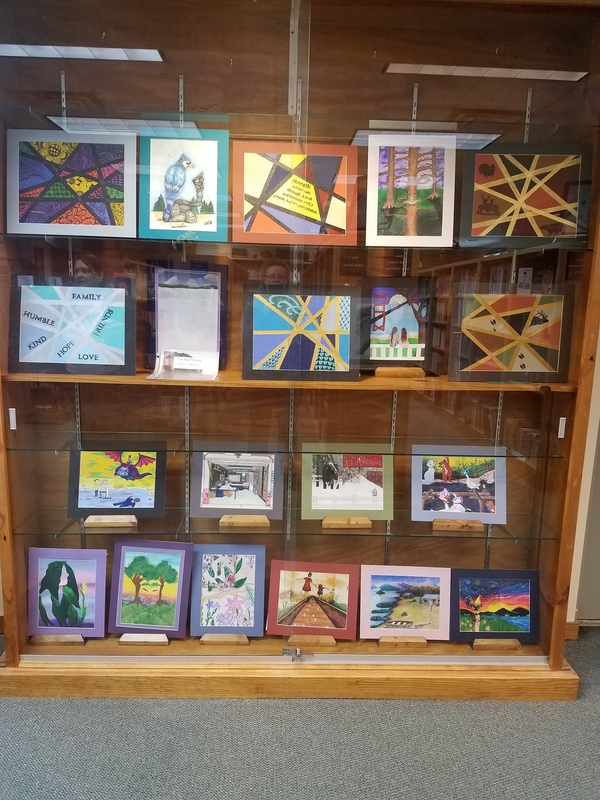 View and appreciate the artistic talents of our own hometown students. Offering novelty shaped cake pans to check out and create eye popping desserts for your parties or just for fun. Support your local library as they can educate you, entertain you and it’s just a nice place to stop and have a friendly chat. 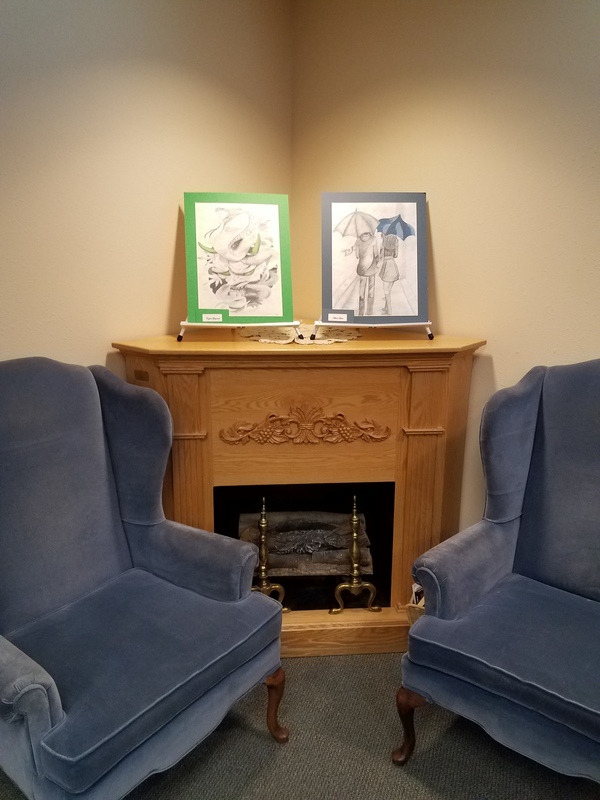 Local Owen-Withee High School students display their talents at an art show in the Withee Public Library. Straight from the classroom of Art teacher, Anne LaVick, comes a diversity of pictures and images comparable to anything you might find in any modern gallery. It features everything from a haunting serpentine creature by Crystal Giegerich, to a beloved family pet by Nathan Parker, to a couple of fantastic homages to the wildly popular cartoon show “Rick and Morty,” rendered by Daniel Erickson and Paula Barrera. And yet still this collection finds more to offer us with beautifully done landscapes to nearly surreal images you won’t soon forget. 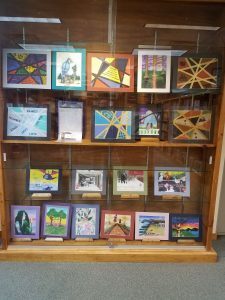 This is only a small sampling of the wonders to behold if you find yourself near the Withee Public Library from March 15- April 13. New for the children – A Solar System Bingo. Come in and get your bingo card, check the master card on the bulletin board and see how many you match. When you get Bingo give to the librarian and receive your prize. Also, get a Moon Passport to color and place into the drawing box. Prizes awarded at the end of each month. Each month we will be featuring a different planet or moon. Take a Martian block home to create for yourself after you have played with the ones in the library. There are many books to check out about the planets and the solar system!